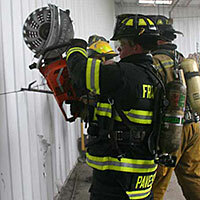 How to Keep Saws and Other Fire Rescue Equipment Running, by Firefighter Nation | Desert Diamond Industries – Your Safety… Our Priority! You’ve got a lot of things to do as a firefighter, and calls are only one of them. You have to train, maintain your certifications, fill out paperwork, do truck and inventory checks… Maintaining your equipment is probably the last thing on your mind. David Cain over at Firefighter Nation gets it. He was deputy chief of the Boulder, CO Fire Department for over 30 years, so he knows that firefighters don’t have enough hours in the day. Unfortunately, that’s not an excuse. Start and run your equipment regularly. Schedule your equipment inspections, like your other checks. Take care of any small problems that you find immediately, before they become big problems. Read the rest of Cain’s article over at Firefighter Nation. This entry was posted in Safety and tagged Firefighting, Safety, Saws on April 9, 2014 by Desert Diamond Industries.